A strong university sector will deliver a strong future – but this depends on ensuring that policy and public investment decisions create the right environment for universities to thrive. Today (Wednesday 10 December), University Alliance will convene a high-level roundtable of experts from across the higher education sector, industry and central government including No10, Treasury and BIS to explore the ‘New Context for Research Excellence’. They will consider issues raised in a discussion paper written with input from experts from HEFCE, RCUK and King’s College London to interrogate what is working well and drive recommendations for future policy. University Alliance is also throwing open this vital debate to a wider audience across and beyond the sector – to stakeholders and others keen to ensure the continued and optimal contribution of universities to our economy and society, and for securing the future health of the UK’s research and innovation ecosystem. “This is an important time for UK research with a number of landmark events, including the Science and Innovation Strategy and the announcement of the REF results, now fast approaching. They will have a significant impact on the UK’s world-leading research ecosystem and its key role in driving economic growth. Both the roundtable discussions and consultation responses will feed into a final report to be published early next year. The discussion paper considers the role of the research ecosystem as a framework model and its three essential characteristics: Selectivity; Collaboration; and Responsiveness. We would welcome your thoughts on these points and how it could help to create the right environment for universities to thrive. 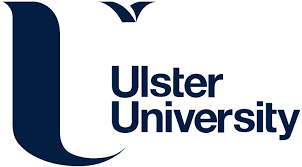 Please send your responses to Dr Faye Taylor, Policy & Projects Manager, University Alliance by Monday 12 January 2015. An ecosystem is a useful framework for thinking about the complex network of activities and partners that contribute to the UK’s success in research and innovation. We’ve come a long way from the linear understanding of ‘knowledge transfer’ to a far more nuanced picture which acknowledges the complex feedback loops necessary to successful, world-leading research and innovation. The concept of an ecosystem can help us understand the complementarity, collaboration and interdependency throughout the system, which contributes to the success of the whole. 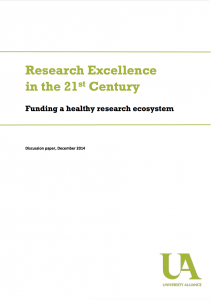 The aim is to keep this ecosystem healthy, responsive and adaptable in the face of a changing landscape – which is why we think it is time to interrogate research excellence within the new context for research. This new context – and the trajectory in the future for scientific research – relies on connectedness, collaboration and openness. The dual support system in the UK is a strength which allows universities to invest in and develop their unique strengths, which they do successfully. An element of competition ensures excellence-seeking is embedded within the ecosystem. For example, individual players across the system know where the expertise and excellence within their field lies and they will seek to work with them. This selectivity results in complementary expertise across the ecosystem, working against unnecessary duplication and resulting in interdependency. This interdependency within the ecosystem makes it stronger and more innovative through collaboration. This is helpful to bear in mind when considering interdisciplinary approaches – especially when the necessary expertise crosses institutional boundaries. The health of the ecosystem now and in the future relies on its adaptability to an ever-changing environment. To be responsive, the ecosystem cannot be inward looking but must engage in a highly networked manner, in this case with the users of research to accelerate knowledge exploitation, and where impact on surroundings and user-informed research processes will be key.